The Outer Banks of North Carolina have a long and rich history based on exploration, seafaring, and lore. Significant historic events have taken place on the shores of the Outer Banks. However, long before Europeans came in search of the New World, Native Americans fished and hunted all along the Outer Banks. Historians estimate that Native Americans first settled on the Outer Banks over 1,000 years ago! In 1584, explorers Arthur Barlowe and Philip Amadas first visited the Outer Banks. Returning to England, they were accompanied by two native men - Manteo and Wanchese - and they reported that the area would be ideal for settlement because of the broad sounds and estuaries. In 1587, over 100 men, women and children came to the island, now known as Roanoke Island, from Britain to settle and begin a new life in the New World. On August 18, 1587, Virginia Dare was the first English child born in the New World. Within three years of their arrival to the New World, the entire group had completely disappeared. Only a few traces were ever found: a few carved stones, the word CROATAN carved in a tree, and multiple items at the actual settlement site on Roanoke Island. There are different theories as to what happened to the colonists. Some believe that they died from starvation or drought, while others believe they may have been assimilated into one of the native tribes. 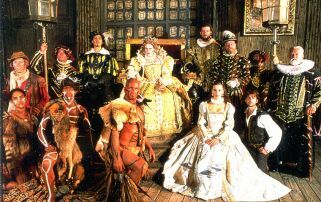 Roanoke Island has an ongoing outdoor drama telling the story of the settlers, now known as The Lost Colony. Stories of pirates' pillaging and plundering are notoriously linked to the Outer Banks, particularly Hatteras Island. 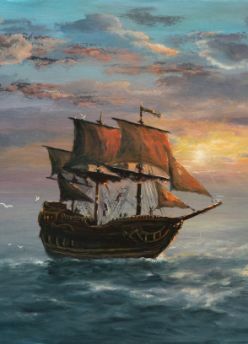 From 1713 -1718, the likes of "Calico Jack" Rackam, Christopher Moody, Robert Deal, Richard Wonley, Anne Bonny, and Captain Pain used the shallow coastlines to their advantage. 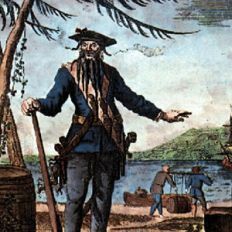 Blackbeard, the most infamous of all pirates, turned to piracy in 1716; before that time, he was simply known as Edward Teach. After raiding several cargo ships destined for Virginia, the Governor of Virginia sent Captain Robert Maynard to end Blackbeard's reign of terror. After a bloody battle on Ocracoke Island in November of 1718, Captain Maynard killed the notorious Blackbeard. Most other pirates avoided the Outer Banks following Blackbeard's death. The area just off of the Outer Banks coastline has come to be known as the Graveyard of the Atlantic because of the overwhelming number of shipwrecks due to piracy and stormy weather. The Outer Banks Pirate Festival is held annually at Roanoke Island Festival Park to celebrate the area's pirating history. During the 1830s, the first wealthy inland plantation owners and businessmen built summer homes along the oceanfront in Nags Head. They found the sea air to be a welcome change from the humid summers back home. By the 1850s, Nags Head officially become a tourist haven for genteel families. 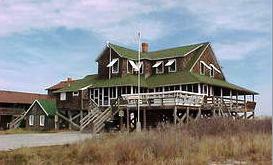 Vacation homes dotted the Nags Head landscape from the sea to the sound, and the luxurious Nags Head Hotel was built at the foot of Jockey's Ridge. Parties, socials, church, bowling, sun and sand were all part of wealthy families' summer activities. At that time, there were no bridges to the Outer Banks, so vacationers traveled by boat across the Roanoke Sound and docked near Jockey's Ridge. The hearty locals who made their living off of fishing and salvaging materials from shipwrecks were called "Bankers." These Nags Head natives had existed in harmony with the sea since the 1700s. The "Bankers" soon began selling fresh vegetables and fish to the vacationing families. The emergence of tourism created a whole new industry for the local villagers. Unfortunately, the shifting sands of Jockey's Ridge claimed the Nags Head Hotel sometime after the Civil War. However, you can still see a row of historic cottages, dating from as early as the mid-1800s, along the Nags Head oceanfront today. These homes were built in the "Old Nags Head Style" with wrap-around porches, cedar shingles and propped shutters. Many of the original homes were built with salvaged wood from long-ago shipwrecks. This row of homes, often called "The Unpainted Aristocracy," has proudly withstood the punishment of salt, wind and water over the years. Often overlooked as an Outer Banks attraction, these historic homes offer a unique glimpse of times past. 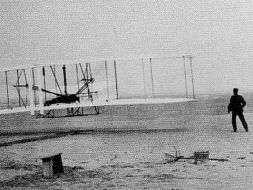 In 1900, Orville and Wilbur Wright came to Kitty Hawk to refine and test their glider. So how did brothers from Dayton, Ohio select the Outer Banks as their testing location? A friend has written the Wright Brothers about the consistent wind and soft, sandy landing spots that the Outer Banks provided. Sure enough, Orville and Wilbur confirmed this information based on data from the National Weather Bureau, and headed south to the Outer Banks. After 3 years of models and trials, Orville Wright manned the historic first flight in Kill Devil Hills, North Carolina on December 17, 1903. Only 5 people witnessed this historic 12-second flight; 3 members of the coastal lifesaving crew, a local businessman, and a teen boy from the village. The telegraph informing their family and the media of this monumental flight was sent from the lifesaving station in Kitty Hawk, North Carolina. It is often misreported that the first flight took place in Kitty Hawk, when it actually took place five miles away in Kill Devil Hills. The Wright Brothers National Memorial is open daily year round. The Wright Brothers Visitor Center includes full-scale reproductions of the 1902 gilder, the 1903 flying machine, a reproduction of the Wright's first wind tunnel, and an engine block from the original 1903 Flyer. Movies, educational programs, and additional exhibits are available in the Centennial Pavilion.